A endodontist is a root canal specialist that deals with problems with the pulp of the tooth and root canal infection. Generally they have completed a dental degree (5-years) and then completed further specialist training (3-5 years) on root canal treatments. Dr Nojan Khalehoghli is our specialist endodontist in London. Treatment of an infected pulp usually requires a root canal treatment. A root canal treatment is when the pulp, containing the nerve and blood supply of the tooth, is removed and a rubber filling is packed inside, with a filling to cover the tooth at the end. Root canal treatment can be very complex and is a time consuming procedure, and in some difficult cases it is best to see a specialist endodontist straight away. This is because the first root canal treatment has the highest chance of success, and if it is not done to a high standard, there is a risk of the root canal infection. If this happens, there is a need for a re-root canal treatment. Unfortunately, the success rates of re-root canal treatments are lower, hence it is important to do our best to get it completed correctly the first time. A root canal treatment can be done in one or two stages by our in house endodontist. It consists of the decay and pulp initially being removed. The canal walls are then smoothed and shaped using single use files. The canals are disinfected using an irrigant such as sodium hypochlorite or iodine. An antibiotic paste may be placed inside the root and a temporary filling placed if the treatment is to be completed in two stages. The tooth is then left for a few days to settle down and allow the intra canal medicament to work. The second stage can then take place. The temporary filling and intra canal medicament is removed, and canals again disinfected. 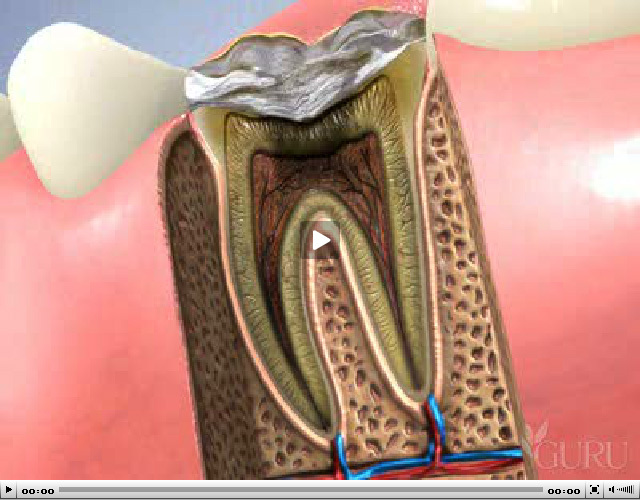 A gutta percha (type of rubber) filling is then packed tightly inside the canal, and a filling placed on top. Most root canal treated teeth require a dental crown afterwards. If you have root canal pain and think you require treatment from our London endodontist, or want to ask a few questions about seeing our endodontist about a root canal treatment, just simply call our number on 020 8090 9077. You can also contact us via email at [email protected]. Root canal treatment is a dental procedure by a registered endodontist designed to treat infection or inflammation of the nerve or pulp of a tooth. This may be caused by deep decay, a fracture of the tooth or severe periodontal disease. The pulp, which is soft tissue (containing nerves and blood vesels) at the centre of the tooth. The pulp has a path that runs down through the inside of the tooth and into the gum and jawbone. This path is known as a root canal. In some cases, a single tooth can have more than one root canal. The term root canal is slightly misleading because it implies that the pulp and the root canal of the tooth are empty. However, the pulp and the root canal are made up of soft tissue that contains nerves and blood vessels. Root canal treatment is designed to save the tooth and prevent the risk of root canal infection. The inflamed or infected pulp is removed from the tooth and the root canal is then cleaned of all bacteria. After the bacteria has been removed, the root canal and pulp are filled in using an artificial substance, before being sealed. Root canal treatment is commonly perceived as being a painful procedure. In fact, in the hands of a properly trained dentists, root canal treatment is relatively painless. Root Canal Treatments carried out at Smile Cliniq, are in-line with best practice techniques using Protaper files, electronic apex locators and Sodium hypochlorite irrigation. Root canal treatment is one of the most challenging treatments for a dentist to perform. There are many risks and possible causes of problems when performing a root canal treatment, and accurate measurements, correct instrumentation, moisture (bacteria) control and correct filling technique are vital to ensuring a good result.